A helicopter flies over the Putnam County Regional Airport. The ‘hundred-dollar hamburger’ he’s talking about is slang in the pilot community. The phrase stems from the long-ago cost of operating a small plane to fly round-trip to and from a restaurant. 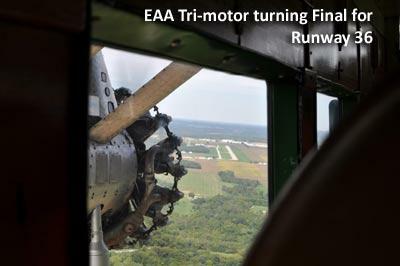 Many pilots made that kind of journey for the airport’s annual appreciation days this summer. But, it was much more appealing to fly to Greencastle’s regional airport when it had a restaurant, hotel, bar and conference center on the field, Scott says. Those services have since been diminished or closed down completely. J.R. Scott prepares for takeoff at the Putnam County Regional Airport. Dozens of other airports around Indiana face the same kind of issue – how to improve when money and income sources are scarce. One way to do that is the Airport Development Fund – a grant available to federally-funded public use airports where three entities split an improvement project’s cost. There are 65 airports in the national airport systems plan, and 70 in the Indiana Department of Transportation’s state plan. Under the grant, the federal government fronts 90-percent of a project’s cost, and INDOT splits the remaining 10-percent with the local airport sponsor. Blake says INDOT hopes to release the latest edition of Indiana Airports’ Economic Impact Study this fall. When it was last released in 2012, general aviation airports reportedly contributed to more than five billion of the state’s $14 billion in economic output. 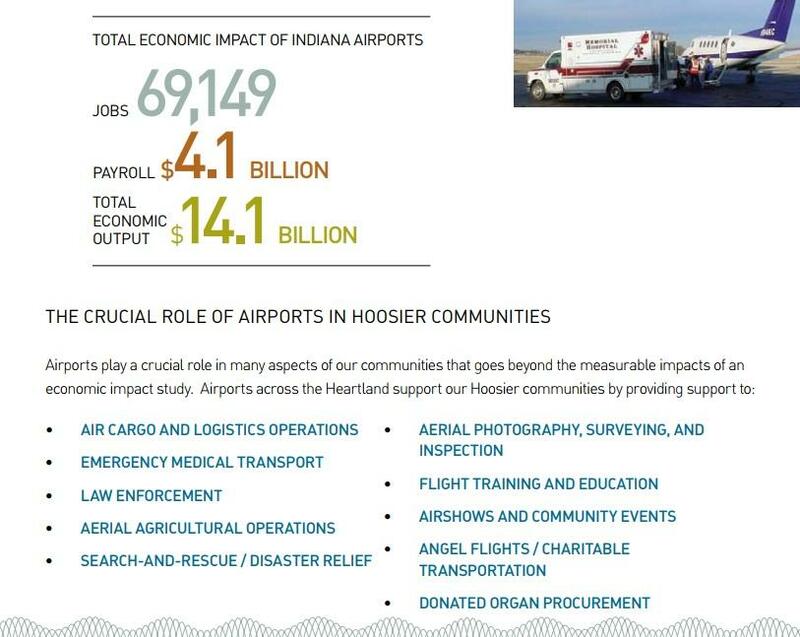 INDOT's Aviation office last released an airports' economic impact study in 2012. Municipalities, such as the City of Frankfort, want a bigger piece of that economic pie. Officials there approved a multi-million dollar hangar project this year in hopes of bringing in more corporate jets. Frankfort Mayor Chris McBarnes says the airport was a sticking point with ConAgra Foods executives. He hopes the accessibility, plus the short drive from Frankfort to Indianapolis, attracts more attention. Back in Greencastle, J.R. Scott says the airport is the reason global material handling manufacturer Crown Equipment planted its business in Putnam County. Scott says a runway can be as important as Main Street, and local officials are noticing. Spectators at the Putnam County Regional Airport's Appreciation Days watch planes fly in. A few thousand visited in the span of the weekend. “The airport’s going to be their first impression of the Greencastle community, of Putnam County, and we want that to be a positive and reflect positively, our community to them,” he says. For privately-owned airports -- such as Franklin’s Flying Field -- federal grants can’t be applied, and there’s no local sponsor trying to hook corporate jets. Instead, manager Robert Cohen is using the money he makes from building rent, flight school and selling planes on the side to rehabilitate the airport. Robert Cohen and mother Jeana at the Franklin Flying Field. Cohen says when he was a child, the airport hosted fly-ins every year but the practice eventually stopped and the airport was abandoned. He says it’s going to take years, but he’s got the same goal as other pilots – to make sure as many as possible can enjoy the airport. Cohen says it’s been at least a decade since the field drew in a big fly-in crowd of more than 600 people. 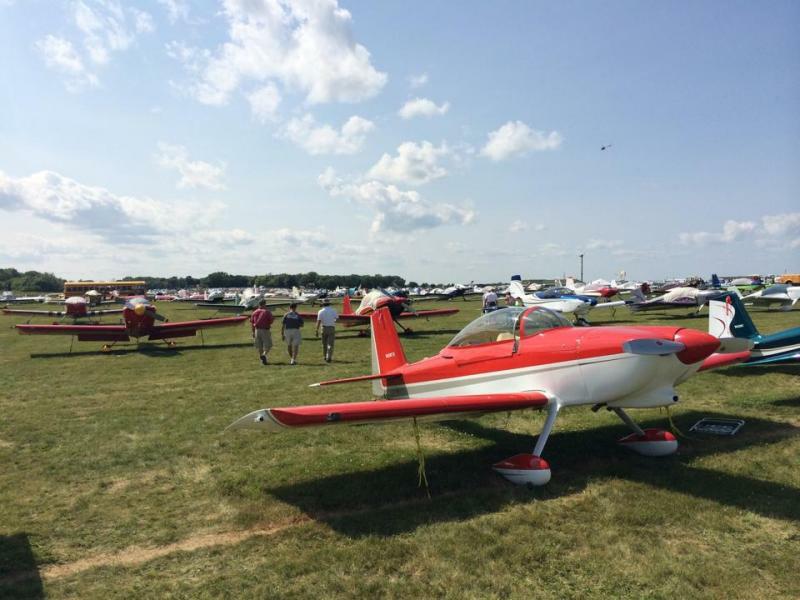 In Putnam County, a few thousand people turned out for the airport appreciation days. 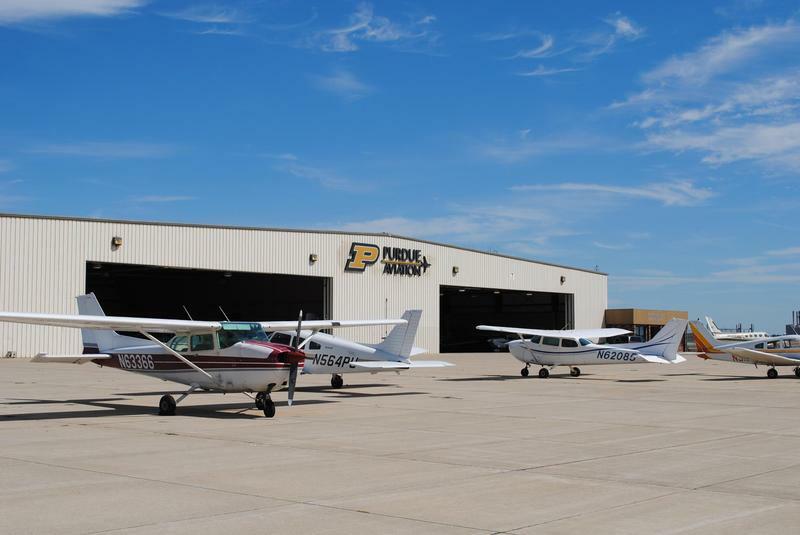 Purdue Aviation has entered a deal with a regional commercial airline to start training pilots. Students in the PSA Airlines Cadet Program would spend a year taking classes and accruing hours of flight time through Purdue Aviation, which is separate from Purdue University’s teaching core. At the end of the program, pilots would receive certifications. From sun up to sun down, aircraft engines are rarely silent at Oshkosh. Most every flying machine imaginable is here – from World War One biplanes, to home built fixed wings and ultralights, to the newest, fastest, most technologically advanced jets. “This is just the best place in the world to spend a week if you love aviation," says 1992 Purdue grad Chris Carrier. He flew commercially for Indy-based American Trans Air, was the chief jet instructor at Purdue for several years and is now a demonstration/instructor pilot for Embraer, a private jet manufacturer.